There are no comments for Corridor. Click here to post the first comment. 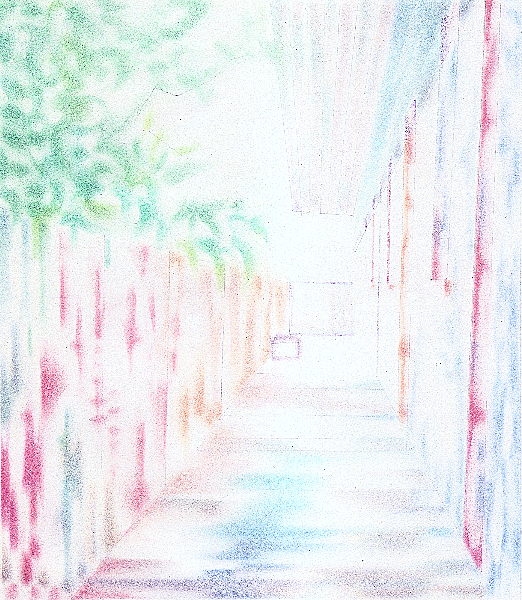 This drawing depicts a short corridor at a motel in Michoacan De Ocampo, Baja California, Mexico. Courtesy of the artist. GUY EDWARD HOFFMAN (b.May 20, 1954) studied drawing and painting under the tutelage of Professor Laurence P. Rathsack at The University of Wisconsin-Milwaukee (BA FA 1976). Hoffman regards his work as paintings that happen to be either drawn or painted in certain mediums, such as watercolor, color pencil, and pastel, and the standards that he applies to them are the standards he would apply to any painting. His use of light and white space can be read as receding or advancing, sometimes both within the same image. A particular quality of light in his work is achieved through this approach. All of his work is derived from nature, organic spaces and locations where he has lived or journeyed to, thus personally experienced.